A Journey in the Life aired on BBC1 at 9.25pm on 6th December 1985 to mark the 5 year anniversary of his tragic murder by Mark Chapman. 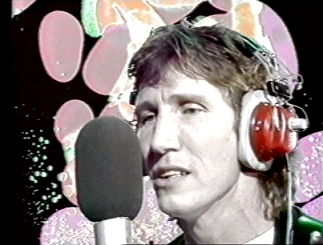 Part of the long running BBC documentary series Everyman, A Journey in the Life was directed by Ken Howard who himself was no stranger to the world of music having co-written many songs for Dave Dee, Dozy, Beaky, Mick and Titch. Oh, and he also co-wrote a song for that little known singer called Elvis Presley. Using a kaleidoscopic blend of dramatisation, archive footage and specially recorded performances (such as Roger Waters playing Across the Universe), A Journey in the Life cleverly taps into Lennon's creative nous. Covering his childhood through to his last few years in New York with Yoko and Sean, the documentary finds Bernard Hill playing the adult Lennon as he wanders through key moments in Lennon's life. 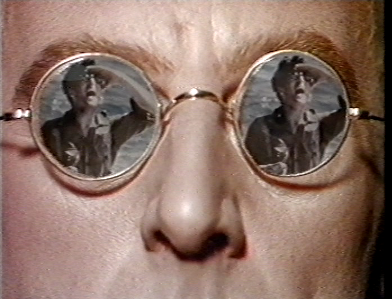 Surreal landscapes form the background against which Lennon tells his story and, believe it or not, one of them is actually footage from the Revs computer game by Acornsoft. Immediately following the programme's broadcast, the BBC featured a short interview with Yoko Ono where she praised A Journey in the Life and reflected upon the five years since his death. A Journey in the Life has never been repeated and, due to the amount of copyrighted material, is unlikely to pop up on YouTube in anything less than a heavily butchered version. If you're interested in a digital copy then get in touch and maybe I can sort something out. It's very difficult to be just a casual fan of The Beatles as their story is so unique and engaging that you inevitably find yourself devouring every tome and documentary dedicated to them. The individual members of the Fab Four, too, have found significant attention dedicated towards the minutiae of their lives and it genuinely feels, in the 21st century, that there's very little left to learn. A Journey in the Life certainly doesn't provided anything new on Lennon, but as with everything Lennon ever said, there's an undeniable pull to it. Bernard Hill captures the cutting, yet playful vocal patterns of Lennon perfectly and, certainly in the later-era Lennon stakes, also passes himself off as a convincing facsimile of the man. It's no surprise to learn that, 10 years previously, he had played Lennon on stage. 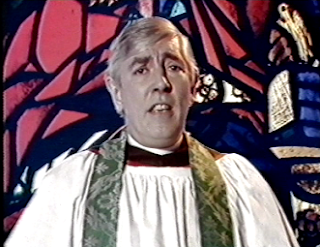 The documentary is also keen to bring together a number of Lennon's contemporaries to appear in small roles throughout, so, for example we get Peter Cook playing a vicar, Roger Waters belting out Lennon material and a slightly terrifying performance by G.B. Zoot Money. They're appearances which are much more than just a flavour of the era that Lennon embodied, but more a distillation of his eclectic tastes and moods. Always keen to push the boundaries, Lennon was a fan of visual aesthetics and A Journey in the Life feeds it appearance through a Sgt Pepper's filter to pay homage to this creativity. 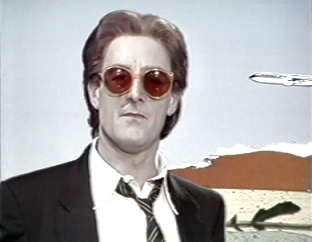 Psychedelic light shows jostle with computer graphics while split screen shots give way to the almost obligatory wonder of 1980s BBC Chroma key technology. It's a smorgasbord of visual delights and in sharp contrast to the more naturalistic atmosphere captured by the Anthology series in the 90s and, even further back, the Imagine film from 1972. Most importantly, though, the Lennon story is downright fascinating. Sure, we've heard all about Lennon's individualism before, but A Journey in the Life really gives it free rein here. The dialogue comprises mainly of bona-fide Lennon soundbites, so it's an undiluted view of the man's mind rather than a sycophantic procession of talking heads waxing lyrical. All the cornerstones of Lennon's legend are carefully dissected with a cutting honesty, so we're treated to insights into his multifaceted persona from his snarling arrogance through to his almost crippling vulnerability. 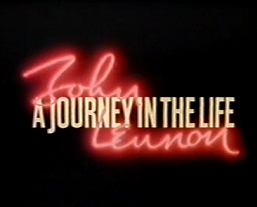 As diverse as the man himself, A Journey in the Life is one of the most enjoyable appraisals of Lennon's career.